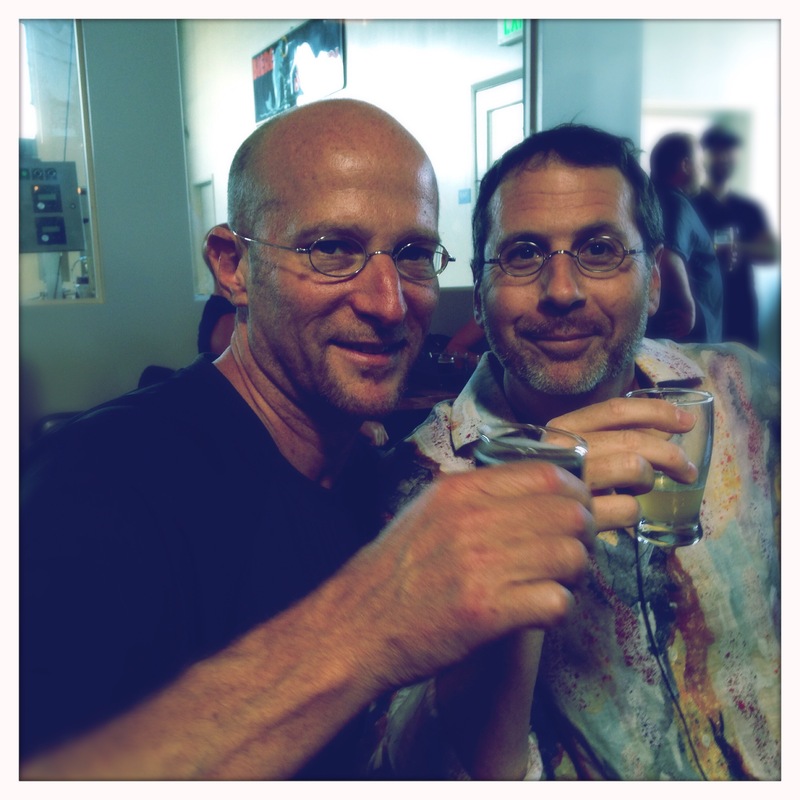 I’ve written glowingly in the past about my friend, Greg, and his home brewing set up. Greg is a lawyer who, I guess, got tired of lawyering and wanted to make beer instead. I’ve been drinking his delicious beers for several years, and listening to his plans to open his own brewery — first in Topanga, and that having proven an impossible-to-navigate labyrinth of permits and regulations, Culver City. When the latter also failed to pan out, he set his sights further south — to Costa Mesa in Orange County — and a brewery was born. Our disappointment in eventually losing Greg and his wife Mary Ann to the O.C. (they’re planning on moving back to Greg’s hometown of Irvine sometime in the next couple years) is Costa Mesa’s gain. 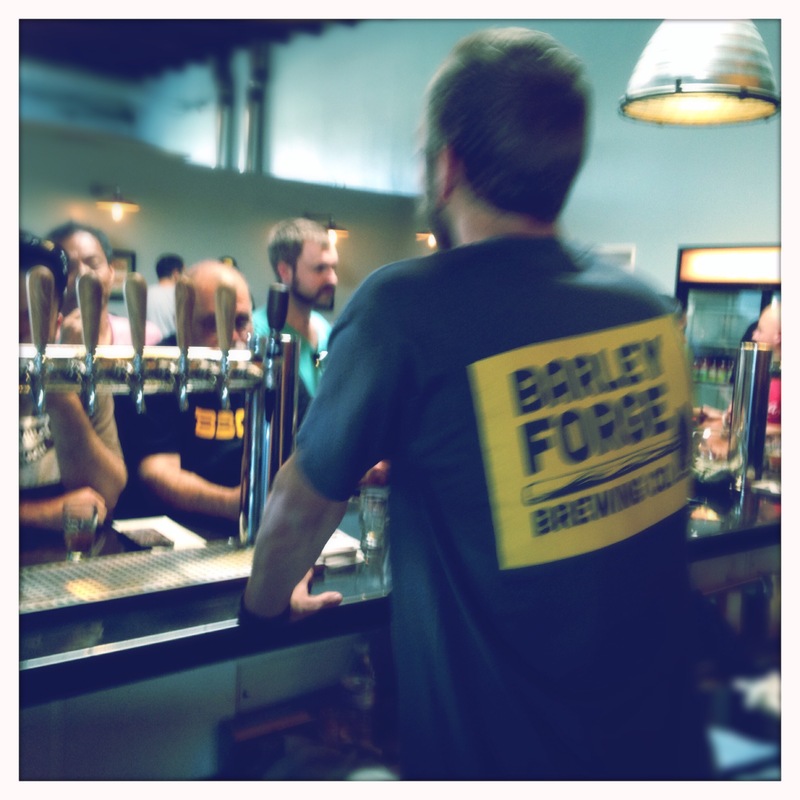 Barley Forge Brewing Co. occupies a large semi-industrial space to the rear of a strip of such spaces also home to art galleries and the like. Across the street in this up-and-coming bit of suburbia is one of those hip carefully planned expensive outdoor artsy anti-mall malls meant to look like they sprung up spontaneously. 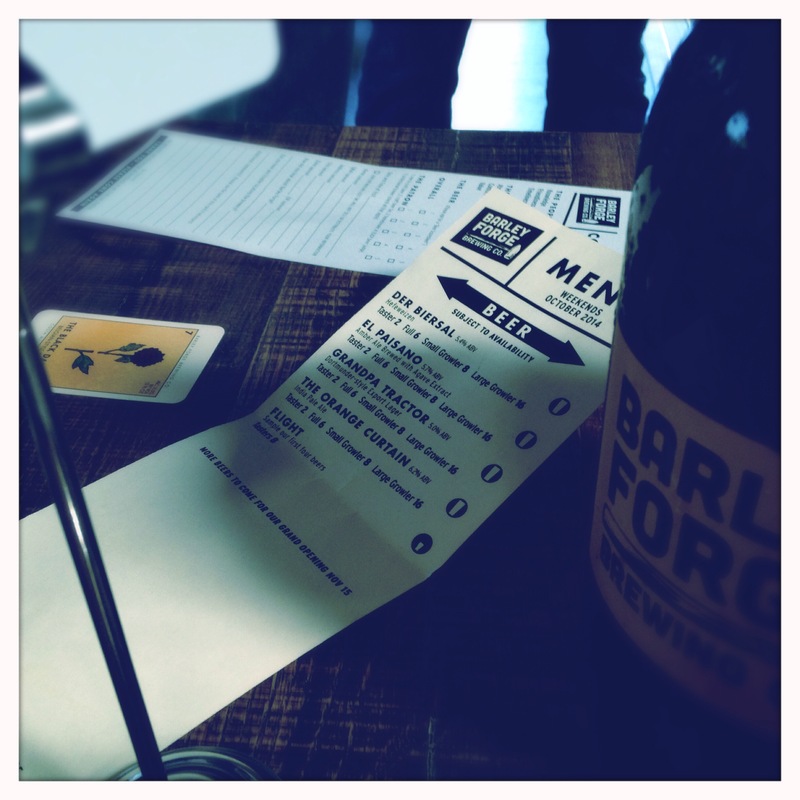 This past Saturday, my pal, Vic, and I drove the hour or so to Costa Mesa on a bro-date for the Barley Forge soft opening. We were sad for ourselves but happy for Greg and Mary Ann when we saw the line for a beer snaking out the door into the parking lot. They’ve done a hot-mash job of branding — from the fun loteria-inspired beer labels to the industrial-hip signage to the groovy merchandise. The space retains an industrial vibe, with contemporary colors and wood tables and bar adding some warmth. 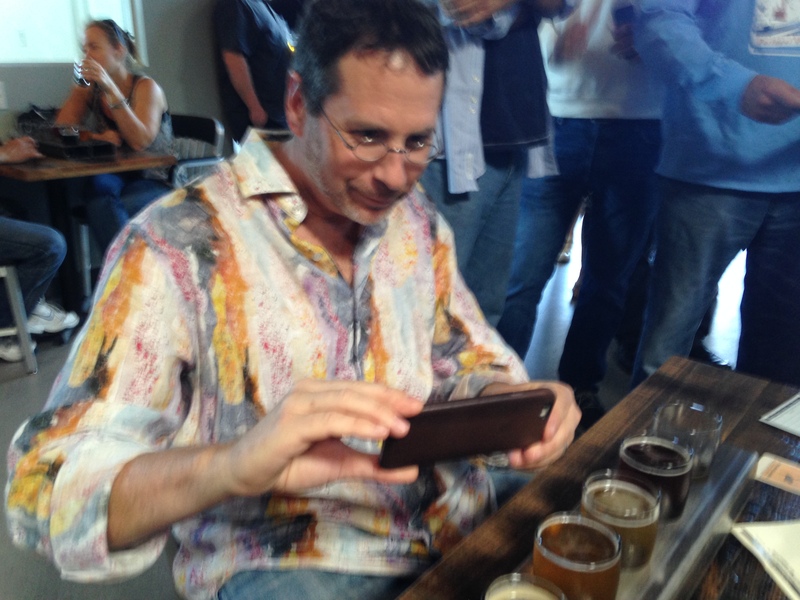 Vic and I each ordered a “flight” — five samplers of the various beers on tap, served in a heavy hunk of steer girder that looked as if it had been pulled from the building’s very foundations. Greg has always been a great brewer. I’ve tasted many of these beers before, in their home-brewed versions. While not usually a fan of hefeweizens, the “Das Biersal” is crisp and complex, not overly sweet. The “Grandpa Tractor” Dortmunder-style export lager has far more depth and character than your standard German lager, and the “Orange Curtain” IPA is a big, ballsy mouthful of beer. Being a hoplover, my favorite will undoubtedly be the “One Louder” double IPA, though they were not pouring it that day. Our friend, Jeff Kramer of Topanga Catering, helped put together a simple menu — a charcuterie platter with house-pickled vegetables, a beer-boiled bratwurst, slider platters featuring pulled pork or lamb patties with tzatziki. There are plans to introduce panini and other sandwiches. Vic and I split a brat and a couple sliders. We were still hungry, so we ordered a second round. “What do you think of the brat?” Jeff asked, still fine tuning. “Do you think it needs a little less sweet and a little more tart?” And he and I huddled to discuss a bratwurst flavor profile worthy of Greg’s towering brews. I think a good burger would be a winner. Vic tapered toward the end of his flight. But I wasn’t driving and didn’t need to stay fresh for anything… so I had a pint of the “El Paisano” amber ale. If I was alone and there had been an empty bar stool, I may have just played the day out working my way through the beer. And I expect we’ll be seeing these beers on the shelves of fine liquor venues and discerning grocery stores before long… Let the hammer fall where it may. You’re right, it is Topanga’s loss…we deserve this kind of venue and these kinds of culinary entrepreneurs. Cheers to Greg, Mary Ann and Barley Forge Brewing Co.
Hey Ant Patty, would that we could go hangout and make a statement about seasoned ladies appreciating fine beers after a life of appreciating fine lotsa stuff. I love a good story about successful start ups! It’s AWESOME for those guys!! There are at least half a dozen breweries in Torrance, which must indicate a beer-friendly regulatory environment in that city. But good to hear your friend found a place in Costa Mesa, too. I’m in favor of more beer. We might try to make it to the Grand Opening on Nov. 15 — they’re cooking a whole pig! We should definitely plan to get together for that. I love whole pig roasts…they go so well with beer. We are always glad to have some former Topanga neighbors join us in the OC, especially if they bring beer, good food or you with them! Let’s plan it! And we can connect on details as it gets closer. The event begins at 11:30. Maybe we could meet there, eat and drink a bit, recommence at Chez Griffin for a proper meal, etc. Let me know how that sounds.